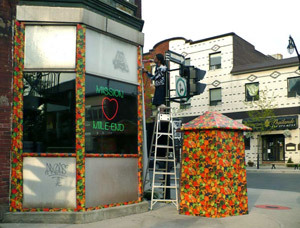 ﻿From May 5 to 23, Andrea Cavagnaro will intervene with the Mile-End Community Mission upon the building that houses it and on its premises. Using various materials from a kitsch aesthetic, she will open breaches in daily life and its power struggles, by proposing a transformation of the building’s facade and a new reading of its interior space. Some of Cavagnaro’s projects call attention to the fragmentation of public space in Latin American cities like São Paulo. A public space is not public, but it’s not private either. It is ambiguous; it is both things at the same time. A public space always belongs to someone and it could also be shared with neighbours and pedestrians concurrently. After studies in industrial design, Andrea Cavagnaro (Argentina) has turned to public interventions that consist of interference or that adds on existing structures and urban furniture. The artist has intervened in the physical settings of a bakery and in its actual operations, in order to celebrate the Bakers Union anarchist past in the 19th century; she has created multiple public interventions on the frontage of houses and buildings; she has improvised urban furniture in places where the Buenos Aires State deemed unnecessary. Mile End Community Mission is a volunteer-run, not for profit organization working with members of the community that have been marginalized by society for a variety of reasons. It strives to create a safe and welcoming community which meets the practical, emotional and spiritual needs of those who need it the most in the area of Mile End.